Pre-drawn Africa geo map symbols help create accurate diagrams and documentation. Africa geo map symbols like Algeria, Angola, Benin, Botswana, Burkina Faso, Burundi, Cameroon, Central African, Chad, Congo, Egypt and more are available here. 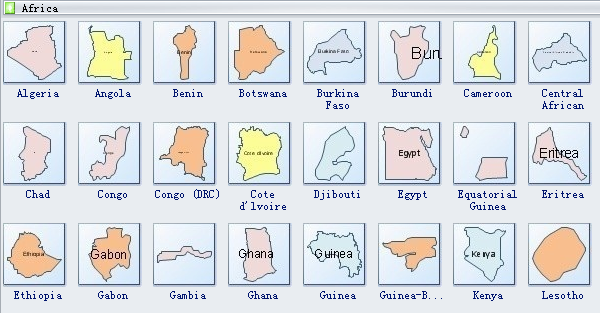 Need fresh looking Africa geo map symbols for your design? These Africa geo map symbols are a cinch to pop in. And their crisp, fine detail will make spectacular, easy-to-understand diagrams and presentations to your customers.